Want to be a part of the fight against hunger in Torrance and surrounding cities? This volunteer opportunity is exactly that!! 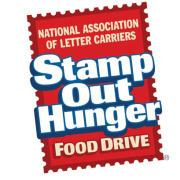 Join us at the Torrance Post office (2510 Monterey St, Torrance, CA 90503) on Saturday May 11th to help load, unload, sort, and team build with your friendly letter carriers! All food collected goes to a few local non-profits; one of which is the Community's Child Healthy bags Program! The Healthy Bags Program provides weekly nutritious groceries to food insecure children who are attending elementary schools in Torrance, Lomita, and Harbor City. Food Insecurity means that the child goes home after school to empty cupboards and will not have enough to eat over the weekend. The Healthy Bags Program is currently serving 180 families in 9 elementary schools every Friday! This program depends on support of local companies and individuals to keep our shelves full and we look forward to being a part of this community event again this year! This opportunity requires repeated lifting and moving bags of food that are ranging from 5-15 lbs, volunteer must be able to complete this task, also remember to wear something comfortable. Parking will be in the front of the post office and volunteers will walk on the side of the building to the loading dock. Please email Amy; Amy.m@cchild.org or call 310-534-4040 ext. 301 for more information! The tentative schedule is from 4:00 pm to 7:00 pm depending on amount of food donated, but as the date gets closer we will have a clearer idea of the timeline and will send it out to all volunteers!